Here’s something cool that a fan whipped up. 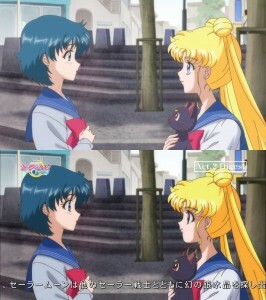 It’s the first episode of Sailor Moon Crystal edited to fit with dialog from the first episode of the English dub of the original Sailor Moon anime. It actually fits quite well though the episode is shorter than the full version as some scenes did not exist in both version. 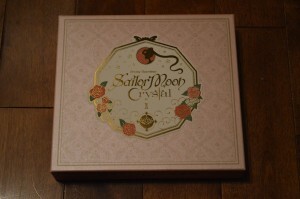 In a few instances a short clip from the original anime is included but for the most part it’s video from Sailor Moon Crystal and audio from the old Sailor Moon anime. She even included a Sailor Says segment! Watch the episode in the embedded clip below. Since both the first episode of Sailor Moon Crystal and the original Sailor Moon anime followed the manga closely this fits very well. Only in a few scenes did things not really work, such as Molly talking to Serena who isn’t actually in the room, but it mostly worked. 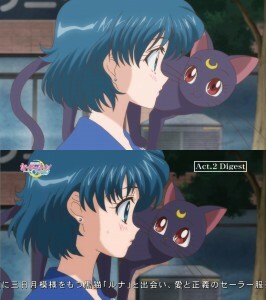 A similar exercise would probably work decently for act 2 and potentially act 3 as the episodes where Ami and Rei are introduced in the original Sailor Moon anime followed the manga quite well. I spoke to Jessica who created this clip about the possibility of more episodes but there are currently no plans to do so as this would become impossible as the series progresses and deviates greatly from the source material. Source: Jessica aka Time Machine on YouTube. This morning the first episode of the new Sailor Moon anime, Sailor Moon Crystal, premiered worldwide on Crunchyroll, Niconico and Hulu. The show is free to watch on a number of these services. For more details, check out these instructions on how to watch the show. I personally found the quality of Crunchyroll’s stream to be higher than Hulu or Niconico’s and so I would recommend checking them out to watch the show if you haven’t already. 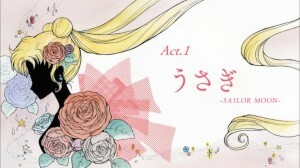 The episode, titled Act.1 Usagi – Sailor Moon, resembled the first episode of the original Sailor Moon anime quite closely. This is fairly expected given this series is meant to resemble the Manga closely and the first episode of each series was quite faithful to that. 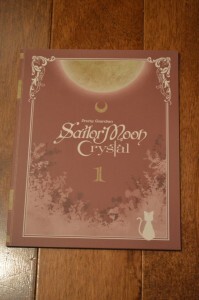 In fact the first Act of the manga is also titled Usagi – Sailor Moon. With only 26 episodes for this series we certainly can’t expect an episode per episode repeat of the original show. In this episode we get a pretty good look at Silver Millennium, the ancient kingdom on the Moon, as well as Princess Serenity and Endymion through a couple of Usagi’s dream sequences. 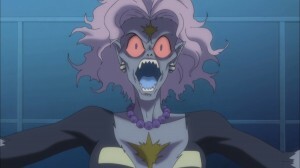 Once again we have Morga, a monster impersonating Naru’s mother as ordered by Jadeite, as the main villain of the episode. 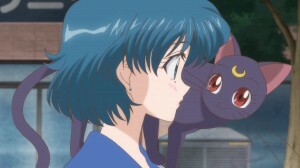 We are also introduced to Luna, Naru, Umino, Shingo, Sailor Moon’s mother Ikuko and her teacher Haruna. 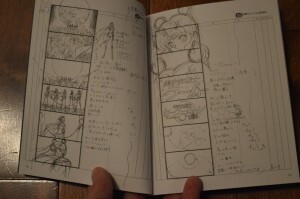 We also see mention of Sailor V, who will later be appearing as Sailor Venus, who shows up in a newspaper, is mentioned by Umino and is the star of her own video game. 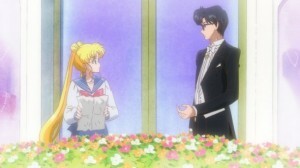 One aspect which bothered me a bit was the reaction Usagi had to her first meeting of Mamoru. Instead of being annoyed but a little intrigued she is instead completely infatuated with him from the beginning. We shall see how this relationship develops throughout the series. If this show truly does mirror the manga, things should escalate fairly quickly. 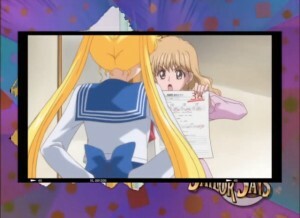 Sailor Moon makes two attack in this episode. The first is the same Supersonic Waves attack which she made in the first episode of the original anime, which she almost never uses again. 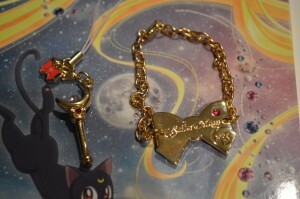 The second was Moon Tiara Boomerang. 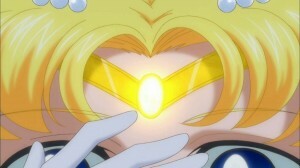 This attack was first used in the live action Sailor Moon series. In the original Manga the attack was Moon Frisbee and in the original anime it was Moon Tiara Action. 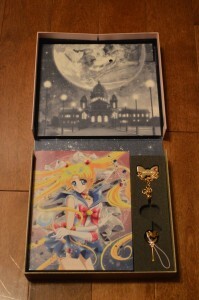 In the rereleased Manga books the move was updated to be called Moon Tiara Boomerang, as is seen here. Act.2, as I guess we are now referring to the episodes as acts, will be premiering in two weeks time, July 19th at 7pm JST, 6am EST and 3am PST in the same places. 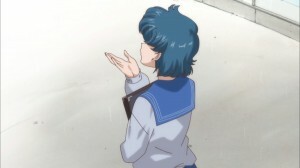 Since Ami is shown very briefly at the end of this episode I would imagine she will be joining as Sailor Mercury as of the next act. 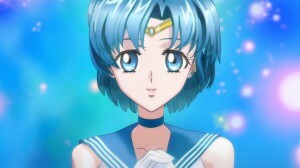 This would be consistent with Sailor Mercury’s appearance in the second act of the Sailor Moon manga “Act 2: Ami – Sailor Mercury”. Keep reading for more screenshots from the episode. 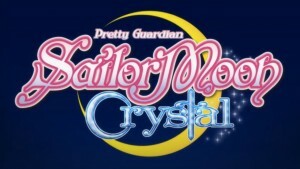 This coming Saturday, July 5th 2014, the first episode of Sailor Moon Crystal will finally be released! 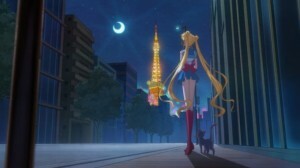 Earlier today, June 30th 2014, in Japan there was a premiere event where the first episode of the new Sailor Moon anime was played in celebration of Usagi’s birthday. A number of screenshots of the intro and first episode have been released. Some sketchy bootlegged video of some of the episode has been leaked as well. 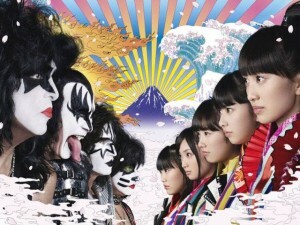 Check out the video below for the complete intro, with the theme song Moon Pride by Momoiro Clover Z, followed by Sailor Moon’s first transformation. 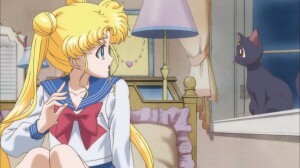 The scene where Luna gives Usagi her broach seems to follow the same scene from the first episode of the original Sailor Moon anime very closely. 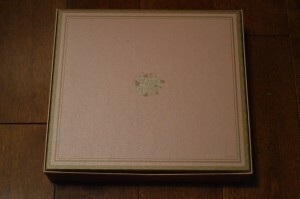 It remains to be seen if the rest of the premiere episode is as similar. Keep reading for a ton more new images and screenshots from the leaked footage.